Judith Kuehne was born in Detroit, Michigan USA. She first studied painting under Gerald Brockhurst RA and subsequently at the University of Michigan Ann Arbor. During her studies there she became interested in ceramics and worked for a year with Bernard Leach and Shoji Hamada, both visiting professors at the Art & Architecture College. For many years, before moving to France, she lived, worked and exhibited in London. In recent years her studio and home has been in Bélarga, a small village in the Languedoc in southern France, near Montpellier. 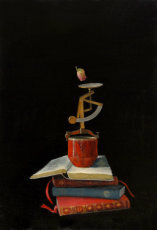 "My paintings, over many years, have ranged from portraiture to semi-abstract landscape but only rarely into still life. Having a small collection of Peter Sparrey's pottery, however, has been the impetus to engage again with my deep appreciation of what I learned from Leach and Hamada, albeit through the medium of painting. The study of 17th century Dutch painting, its use of symbolic images to represent its philosophy, has resulted in the series of recent years. 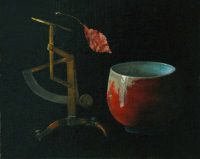 Central to these paintings are Peter's work, embodying clay and fire in the finest use of these elements".